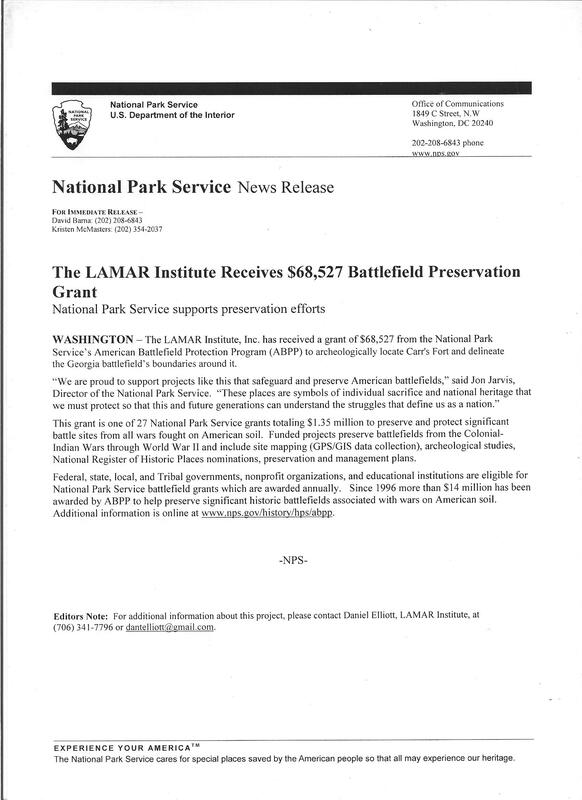 Official NPS press release for our grant project award. light on this turbulent time. Calling the Wilkes County battle site at Kettle Creek “the most pristine Revolutionary War site left in the United States,” a new advisory committee met recently to kick off a study to formulate a land use plan for the site. Project lead from the CSRA Regional Commission’s Planning Department will be Christian Lentz with Jason Hardin as research and plan developer, along with Anne Floyd, Director of Local Government Services at CSRA RDC. The Kettle Creek Advisory Committee will hold additional meetings in 2012 on October 16 and December 11, as well as a final meeting on February 13, 2013. Owen said that a public meeting and open house is being planned for a date yet to be determined. The Kettle Creek Battlefield Association has provided the primary leadership toward driving this project and for the preservation efforts. The KCBA membership has been joined by the state organizations of the Sons and Daughters of the American Revolution from Georgia, Florida, North Carolina, and South Carolina, as well as members in 15 states as far away as the West coast, he said. In addition to the CSRA personnel, the committee members in attendance included Joseph Harris, KCBA; Thomas Owen, KCBA; Betty Slaton, KCBA; David Tyler, Wilkes County administrator; Jim Rundorff, Plum Creek Forestry director; Walker Chewning, KCBA; David Jenkins, City of Washington economic development director; Jenny Clarke, executive director, Washington-Wilkes Chamber of Commerce; Stephanie Macchia, Washington Historical Museum director; Emory Burton, KCBA, and Steven Rauch, U.S. Army command historian, Fort Gordon.